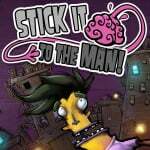 You may remember news earlier this year of Stick It To The Man being confirmed for the Wii U. It's a peculiar-looking title that involves puzzle-solving, some stealth and platforming, along with mind reading. All standard stuff. It's previously been released on PC, PS3 and Vita, but developer Zoink Games told us that, for Wii U owners, it's like you get the gold version. We don't have much longer to wait to see whether that's the case, thankfully, as publisher Ripstone has now confirmed that it'll arrive on the Wii U eShop in Europe and North America on 1st May at a price of £6.99 / €7.99 / $9.99. We'll be using Ray's spaghetti arm to read thoughts in no time. This looks like a crazy and fascinating game, and we got into the details of it and the Wii U version in our interview with Ripstone and Zoink Games; be sure to check that out. The previously released trailer is also below, so let us know whether you're interested in picking this up. Yup, I was gonna get this but Sony 1up'd Nintendo again and I'll be getting it for free next month. Will wait on the review, but it looks interesting. I have a few other purchases to make so this maybe missed for now. Did not expect it so soon. If it is good (and judging by PS3 reviews it is) I will gladly pay the $9.99 to support another developer publishing games on Wii U. This looks great, can't wait to see the review for it. @readyletsgo @ferrers405 To be fair it's only available on PS+ to PS4 owners, who need to have PS+ to play online, and its $50 per year. And I don't know if there are a ton of people who own both Wii U and PS4. If this were on PS3 I think it would be a much bigger problem for Wii U sales. I would like to see Wii U get a PS+ type program, called "Nintendo eSelects", where we could get 2 games per month - 1 DL retail and 1 eShop. Maybe next system in 5 years. I've been waiting for this but Child of Light 2 days earlier is probably getting my money - $5 DDP credit and $10 eShop card from Target. Just bad timing. Though maybe reviews will change my mind. I also think this will be on sale for $5 before CoL goes on sale for $7.50. Looks errrrrrr........interesting! Think I'll wait for the review. I'll get this if it doesn't come to PS Plus for Vita. People misunderstand the whole 'free' games with PS Plus thing. They're only 'free' until your PS Plus subscription runs out, if you choose not to keep renewing it. Me? I'd rather make a one off payment for the game and get to keep it. Xbox Live 'Games With Gold' is different, you get to keep the games even if your Gold subscription runs out, although that seems to be why they offer fewer (and much less recent) games with the promotion. @ToxieDogg : it's aggravating how people think it's free. You're paying a yearly premium, and guess who picks up the tab for all these free games? Sony. Personally, when a game goes up for free it devalues it for people that previously bought it. I hope Nintendo never goes this route. @ToxieDogg what did i said? Free with plus if you don't renew you lose, of course (practically a rental-free), but keep in mind that PS4 need plus to play on-line so if you have one PS Plus is almost "mandatory" and you don't lose access to the games. @Cyberbotv2 i don't see a problem with devalue a old game, in fact i think it's better when more people get a shot to try a game because it's at a lower price, i personally always buy a game who i like when it launches but the others i just wait for a lower price to buy new, what i don't support is used games, so my money goes directly to who made a game that i like and need support to make others. @ferrers405 Well, "free with PS Plus" is kind of an oxymoron. It's certainly a nice perk, but I still hate the idea of paying a yearly subscription to even be allowed to play online if you want to. I almost never play online, by the way, so I wouldn't get it for "free" even if I owned a PS4 (since I wouldn't own a PS+ subscription). I was wonder when someone was going to bring this up. PS+ "free" games annoy me to no end. It's great for people who buy a game, then never play it again, sure. But personally, I hate continuous pay-to-play models. If I want to take a 10-year break from a game I don't want some subscription looming over my head. @ferrers405 Well, I'm not saying I don't understand why they charge for it; it's just that online play isn't really my cup of tea most of the time. I prefer games with a robust single-player campaign (that's the single most important aspect of a game for me), and almost all of my multiplayer is done on the couch. Whenever I think of the games you mentioned (Mario Kart 8 and Smash Bros), for example, all I can think of is "I can't wait to have my mates over to play over some beers and chips". Yeah, yeah, I'm kind of an anomaly in this day and age, but them's the breaks. I for one am glad I'm able to play online on my Nintendo platforms whenever it strikes my fancy, and I really doubt I'd be willing to shell out the extra cash for a subscription to something I'll rarely use anyway. But to stay on topic: I cant'wait to try this game. It seems just the right kind of quirky, and it seems they have incorporated the gamepad well. @ricklongo I understand you, i prefer single player too, but games from Nintendo for example like Luigi's Mansion, Mario Kart 7, Kid Icarus and Pokemon are so good that i played more on-line than single-player. Been looking forward to this. PS version got lots of good reviews. 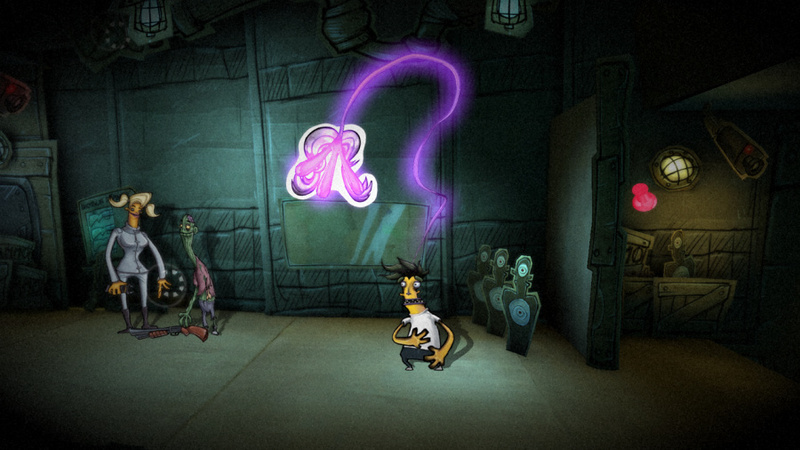 Reminds me of something Double Fine would make. That's a good thing. Day one for me. Will be grabbing this for free off PS+, it's looking pretty interesting. Will be grabbing it on PS+ next month meaning I'll only have to worry about Child of Light next week, unless Pier solar decodes to show up. The thing with PS+ is that you've paid the subscription do once the £40 is down the games you get after the first month feel like they are "Free". Value wise it's certainly worth the price. I don't how many games I've played on PS+ that I loved but maybe wouldn't have bought because I wasn't too sure. And I've certainly skipped a few games on Wii U because of my subscription. It's the reason I bought a Vita; because I had a long list of games waiting on my account gat I wanted to play. I won't go into discussion about this "free" version, I just wonder how much it costs on other devices! I would like to download it, but I fear Nintendo overpriced it as always! @ferrers405 @readyletsgo @Marshi The term "free" is not valid for neither PSN+ nor LIVE Gold because you have to pay for the subscription! Is that simple. It IS a better value because you only pay a few dollars for the games depending on how many you download in a year. Now, for LIVE, you get to keep these discounted games so you actually buy them. For PSN+, you are only RENTING the games because you can't play them after your subscription ends. DO THE MATH: If you were to DL EVERY SINGLE "free" game offered on PSN+ or LIVE Gold in a year (which I'm sure you're not), you're still paying at least $2.50 per game. So kids, really, don't be fooled by the terminology companies use. Whether you pay $10 or $2.50, those games aren't really "free". @Dark-Link73 yeah, Ps Plus is practically a rental program, but it's 5 games a month, so $60 a year which make less then a dollar a game (in a year subscription). @Dark-Link73 - your math is way off. PS+ has given away 259 unique "free" games since it's inception in June 2010. Over the past 12 months, they have given out 63 games (with one more due in April). A full price yearly subscription shakes that out to around $0.78 per game. That doesn't take into account discounted subscriptions (I grabbed an extra year for $29.99 on Black Friday) or the fact that I probably save over $50 a year in discounted games. I don't have the numbers as readily available for discounts, but I made purchases of at least one game on 16 different occasions over the past 12 months, and every one of them had an additional discount thanks to PS+. Just over $4 a month for a library of over 250 games and counting (many of them playable on multiple devices), discounts, online saves, and PS4 online play is the best deal in gaming. The fact that I'd lose access to the "free" games if my subscription expired is rather pointless, since I can't imagine ever letting my subscription lapse. I'd also like to question why you would think I wouldn't get every free game offered. I paid for access to it, of course I'm going to grab it. The only time I don't get a game for free is if I already bought it. That only happens to me a few times a year. There are a lot of games I've tried and discarded because they're not for me, but just as often I find something I never would have purchased on my own but absolutely fall in love with. @bstie1198 My math itself was not "way off", what was incorrect is that I took into account only 24 games per year like LIVE Gold gives out as supposed to an average of 60 as you guys state PSN+ gives out. As for losing access to the games, is not "pointless". I have game consoles and game libraries that go back 25 years, so if you happen to be an avid PS gamer as I am Nintendo's, I'm sure you'll still have your consoles 25 years from now. By then, i seriously doubt you'll be able to access and play your 250 "and counting" DL game collection. Also, what happens if your online goes down? Can you still play your DLed "free" games? As for downloading every free game just because is there. I don't do that. My kids have Gold and they don't DL everything just because they can. Only what is of interest to them and myself. No reason for us to be greedy. @Marshi I know it's a great deal. I even acknowledged that. I'm just trying till bring awareness to the fact that, in this case, "free" is an illusion. I personally hope Nintendo doesn't charge anytime soon for online. I don't have Gold because I believe it's extortion to charge extra sure a feature already included in gaming for years. Gamers complain that the Wii U gets "half of games" because they don't have DLC or a mode, well what about PS and and xbox having to pay extra to be able to play online? Now THAT is truly getting "half of a game" because at least missing DLC doesn't deprive the Wii U owner of the while experience of such game. No online gaming just because one refuses to pay extra, that's extortion and an incomplete game too. @ferrers405 Yeah. I calculated to only 24 games a year, not 60. It is an awesome rental deal provided you get every single free game. Any game DLed after the 7th game makes it a better deal regardless. But you see, that's on Sony willing to lose a sale, I don't think Nintendo can afford that. They're not conglomerates like Sony and M$. @Dark-Link73 hmmm id actually say having to pay for online AND having these god awful "half ports" with missing features and dlc is extortion. I do agree ps plus isnt free,i never said it was,but at £40 a year I get ALOT for my money. I truly believe the future is a subscription model. I have lovefilm and netflix and dont feel the slightest bit extorted for all of the entertainment I want within easy reach and use. If nintendo asked for £10 a month to download and play any game of thiers on the wiiu I think I would explode with happiness. @Marshi You do get a heck of a lot games for what you pay. Personally though, I'm an old fashion kind of gamer and as much as I'm embracing full retail DL games, I still prefer to have physical copies of games and have the liberty to play a game any time I wasn't without being tied to a subscription service, the servers are ruining or out, and whether or not my internet is running or not (which is something I enjoy on Wii U and my 360. Once the game is in my HDD, it's mine to play whenever I like as long as my console works and there's electricity in my home, lol). I have hulu plus and Netflix, but I find it rather annoying when their servers are down or my modem happens to be acting out. Also, at least with those services, if they don't renew a license, the movie/show is gone and we can't watch it again. I enjoy being able to go back to any game in my collection regardless of how old it is. If I understand correctly, these are inevitable problems that might arise with PSN+. Another gripe I have is that, why do we have to pay M$ and Sony money for being able to use Netflix when I'm already paying for that service. I understand is their console but I'm already buying a console for hundreds of dollars and I'm only allowed to enjoy some of the features it offers unless I pay more money a year? Talk about buying a "half of a product". I don't know. I suppose we belong to two different generations of gamers. Speaking of downloads: Whether we like it or not, the future will be that Netflix-like sites will offer everything. Not only movies and series, but also music, books, comics and videogames! Everything will be streamed or downloaded temporarily, real ownership will be over. DVD, CD, Blue ray, it all will vanish. And if a movie/series/book/game will be removed it may be gone for good! I'll get this game eventually. Child of Light and NES Remix 2 will take up my time for a while. Oh, and so will Mario Golf: World Tour. @Henmii The developer priced it. Nintendo did not. @ferrers405 PS Plus isn't free. How do you know? And even if that is the case, why do developers always have to overprice their games on Nintendo consoles? !